Crate training your puppy can be a positive and rewarding experience for your puppy and you. It doesn’t have to be an unkind act, on your behalf, to want to keep your puppy in a crate when you’re not around. With the right crate and training technique, your puppy will be more than happy to relax in her crate. Puppies feel secure in a cave-like area. Keep your puppy in a crate for a short period of time is completely safe, unless you do it for long periods of time. The crate has to be a happy and private place for your puppy to go to when there as pestering children or other dogs around. Crate training a puppy is a new habit for you and your puppy. It has nothing to do with forcing your dog to enter and stay confined in a crate when you want to. It has to be more about what’s right for your puppy, both indoors and outdoors. With that said, here’s what you need to know before crate training your puppy. The crate needs to be of the perfect size and shape for your puppy. Nothing that feels too confined and inflexible. Your puppy should be able to move around, stretch, lie down to sleep in any position she wants. Consider buying a wire mesh cage and not a hard plastic container. The former is more secure as your puppy can take in her surroundings. The latter will make your puppy feel caged-in, abandoned, and suffocated. Puppies grow every day, so taking into consideration your puppy’s future adult size is important. You will find crates with flexible sizing options that can allow you to enlarge the crate as your puppy grows. This may cost an exorbitant price. As an alternative, you can opt for an adult-sized crate and use a hard cardboard to create a barrier based on your puppy’s present size. The goal is to make your puppy feel comforted and at-home in her crate. Opt for soft-edged barriers and crates as puppies tend to chew down on items as they mature. The next thing you need to do is choose an appropriate crate location. Choose a high-traffic area in your home where your puppy will feel safe and undisturbed. Puppies sleep for long stretch of hours so finding a comfortable spot for the crate is ideal. It’s a fact that dogs feel more secure around family members, so keeping the crate in your living room from where you can see your puppy and your puppy can gaze at you is ideal. Preparing your ideal crate also includes adding a few toys for your puppy. Make sure the toys are puppy-friendly and sturdy enough. You wouldn’t want your puppy to chew the toy and swallow broken pieces. It could cause a serious bowel obstruction in your absence. Based on your puppy’s temperament, you can consider covering the wire mesh crate with a warm blanket. This is so your puppy feels safer and more comfortable in her own den. This also helps when you’re training an anxious dog. It helps her relax and get used to her surroundings with you out of her way. Crate training your puppy has to be a healthy process. 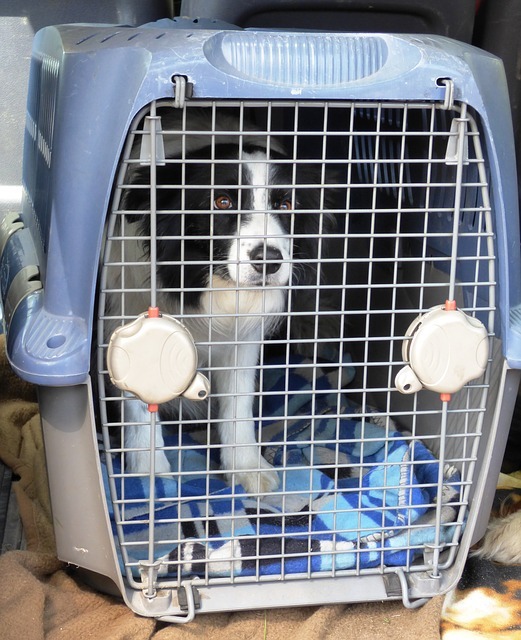 If you fail to do it correctly, your puppy can feel caged, frustrated, and abandoned. Even in her own home. Before you start with the training process, there are a few things to keep in mind moving forward. Avoid using the crate as a punishment. The crate has to be your puppy’s safe haven and not something he learns to fear and avoid. Leaving your puppy in the crate for too long can make your puppy depressed and lethargic. She needs to get enough exercise and human interaction in the day and night to mature into a healthy and happy companion. If you’re training a puppy 6 months under, keep her in the crate for not more than 2-3 hours, at a time. Physically, your puppy won’t be able to control her bladder and bowels. They may lead to a psychological or bowel movement issue. Keep light treats inside the crate to reward your puppy for her good behavior and effort. Your puppy will come to love and appreciate the crate. This is the first time crate training your puppy, so the process can take weeks. Training an adult dog takes days because they have a more attentive temperament and past experience. But puppies are a different tale altogether. I’ve mentioned this before and will do so again that crate training should be a positive and comfortable experience for your puppy. So taking small steps toward achieving your goal is the ideal way to proceed. Going too fast into the training process will make her scared and she will come to think of the crate as a punishment. The first step is to introduce your puppy to the crate for the first time. Once you bring the crate home, place it in a central place where the members of your family spend most of their time. This can be your living room or dining room. Start by placing a comfortable blanket or towel in the crate to make it more inviting. Keep the door of the crate open and let your puppy wander in and out of the crate. Do not guide or force her into the crate at this point. Puppies are naturally curious beings. They explore their surroundings completely before they feel safe and at-home. There is a possibility that your puppy might sleep in the crate right away. The warmness of the blanket will make her feel safe and around her family members. In case your puppy isn’t a curious pooch, gently bring your puppy closer and closer to the crate. Talk to her in a happy and positive tone. This is to make sure your puppy isn’t frightened by the mammoth sitting on the corner of the family room. You can encourage your puppy with the help of small doggy treats. Start by dropping treats close to the crate, and not inside it. Gradually, your puppy will wander inside the crate, hoping to find a treat which you can hide under the blanket or keep it at the corner for her to find and enjoy. Forcing your dog to enter by pushing her towards the treat kept inside the crate is a bad idea. If she refuses to go all the way inside the crate, don’t rush. Continue dropping her favorite treats into the crate until your puppy can wander in, sleep, and exit the crate on her own. You can even drop a few of her favorite toys inside the crate. This step may take a few days itself or maybe even weeks. After a few days of introducing your puppy to the crate, feed her meals near the crate. Food is a good way to make your dog feel safe and at-east. So each time your puppy requires food, place it near the crate to create a comfortable associated with her crate. Once your puppy feels secure enough to enter and exit the crate, place her food bowl all the way in the crate. If she refuses to go all the way back, place the food bowl near the entry and with each passing day, push the dish a little further back towards the end of the crate. Once your puppy starts eating in the crate, leave her to do so for a few days. Then start by closing the door of the crate while she’s eating. On the first day, keep the door closed only until your puppy’s has finished her meal. Open it immediately after she finishes her meal. With each passing day, keep the door closed for longer, maybe a few minutes longer, until your puppy feels safe to stay in the crate 10to 15 minutes after she finishes her meal. Unless your puppy whines and tries to open the door, you can increase the length of time by a minute each time you feed her. If you rush into this step, it is likely that you increased the length of time too quickly. This may frighten the puppy. At the same time, do not let your puppy out while she’s whining. Let her calm down, then you can let her out of the crate. By doing so you’re not encouraging her to whine each time she wants you to let her out of the crate. She may think of that act as a positive habit and will continue doing so until you let her out. This step might be challenging for both you and your puppy. Once she starts eating her meals regularly in the crate and is okay with you keeping her in for 15 minutes at a time, it’s time to practice longer crating periods. First off, you need to keep her in the crate while you’re home. If you plan on going away during this step, do not proceed with it as it may have a psychological impact on your puppy. She may come to avoid the crate completely and will stop eating her meals unless you keep the food bowl outside the crate. Stand near the crate and call out to her. If she responds and comes running to you, give her a treat. Talk to her in a happy and rewarding tone of voice. Now, point to the crate and give a command to enter. You can use words like “kennel”, “crate”, or “bed.” This will encourage her to associate that name to the crate and each them you use that word around her, she knows it’s time to enter her crate without hesitating. Once your puppy responds to this method, give her a treat each time she enters the crate, pet her, and close the door. Let her get used to her surroundings inside her crate for 15 minutes. Leave her inside and walk into another room where she can’t see you. Do this only for a few minutes. Return back to the room, sit beside the crate without uttering a praise, and let your puppy out. Continue doing so for a few days while increasing the length of time you leave her alone in the room. Once your puppy is used to this pattern, she won’t get frustrated or anxious each time you’re out of sight. If your puppy rests quietly in the crate when you’re not around for 30 minutes, you can leave her inside for longer. If you’re comfortable, you can let her sleep inside the crate with the door closed for a night. Let this pattern flow for several weeks before you proceed to the next step. This step is divided into 2 parts. You can opt for either one or both based on how comfortable your puppy is when she’s inside the crate. Once your puppy doesn’t feel frustrated or anxious inside the crate for about 30 minutes, there’s no harm in leaving the house for while she’s in the crate. But make sure you do so for a short period of time. Make the crate a happy and playful environment by leaving her favorite toys or treats. This way she won’t become anxious or afraid when you’re out of sight. Your puppy knows when you’re in another room or when you’re not at home. They also know when you’re about to leave based on your habits. So crating them 5-10 minutes before you leave is also an ideal option. If you’re worried about affecting her temperament when you leave, do not pet her longer than you usually do before leaving. This makes the transition more emotional and distracting. Remain calm and pet your puppy by giving her a treat and leaving the house quietly. If this goes successfully, you can monitor your puppy with the help of a puppy monitor to observe her response to this new change in environment. When you get back home, calmly praise and love your dog for her good behavior. Do not resort to an over-enthusiastic welcome. You can leave her for short periods of time, even when you’re home, so she doesn’t feel alone or abandoned when you’re not around. Once your dog responds to your request, let her in the crate and give her a treat. If you’re planning on crating your puppy at night, keep the crate close to where you sleep. So placing the crate in the bedroom or near the entry hallway is a good idea. Do not isolate the crate as your puppy might associate feelings of social isolation with the crate. This applies to both puppies and older dogs. On some nights, allow your dog to sleep with you on your bed. This is a good chance to strengthen the bond between you and your puppy. The time spent on training your puppy to rest comfortably inside the crate will allow your puppy to understand your needs better and vice versa. A crate can be a healthy way to introduce your dog to a bathroom for peeing and pooping. Believe it or not, many parents start housebreaking their puppy from the first day itself. It is a healthy and pet-friendly technique to make sure your puppy understands where to poop and where not to. To housebreak your puppy, she needs to feel secure and comfortable inside the crate. That’s when you need to follow the crate training process above. After that is through, the next step is to keep your puppy inside the crate while you’re in the room. Take her out to pee and poop every 20 minutes. By doing so, your puppy understands that peeing and pooping inside the house is a complete no-no. If she responds well to the technique, praise her with treats, love, and her favorite toys. You can let her run free anywhere she wants in the house too, if you like. Another excellent way to keep tabs on your puppy during housebreaking is with the help of a journal. Keeping a tab on the number of times your puppy wants to go to the bathroom is important. That way, you can develop a healthy bathroom and walk schedule for her. Housebreaking a puppy should be a productive and positive experience for your pet. Shower her with love and affection each time she goes to the bathroom or outside to pee. Once you start noticing that your pet is waiting for you to take her outside or to the bathroom, reduce the crating time. Gradually eliminate the crate altogether by taking your pet outside regularly. Introducing your puppy to a crate is simple only if you do it right. Otherwise your pet will associate feelings of abandonment and frustration with the crate. And you don’t want that. It may be so that your dog isn’t adjusting to the kind of lifestyle you want. In that case, eliminating the crate completely is a good idea. To make sure you avoid torturing or emotionally disturbing your dog, look out for these issues. Whining: When a dog whines or cries incessantly into the night, there can be 2 reasons why she’s whining. Either she doesn’t want to stay in the crate at night or she wants to relieve herself in the bathroom or outside. If you’ve crate trained your puppy the right way, you should know why your pet is whining. And that is to go to the bathroom to relieve herself. This is because, during the crate training process, you have made sure not to reward your pet when she cries to be let out of the crate. Do not yell or pound on the crate to force her to stop whining. That will make matters worse. If your puppy is getting extremely anxious and restless inside her crate, consult a veterinarian for further help. Do not use your own personal tricks to calm your anxious puppy. It might make matters worse. The benefits of crate training are plenty, but only when you train your puppy correctly. When done incorrectly, crate training can provoke feelings of desperation, depression, and frustration in puppies. And from such a young age, you do not want your puppy to suffer from strong negative feelings. If your puppy is not responding well to this crate training technique, consult an animal-behavior specialist or a veterinarian for further assistance. Some dogs have anxiety of separation and social isolation, so crate training at such times can ruin the bond between you and your pet. That said, allow your dog to naturally get used to the crate and to follow her instincts.